Do you ever wonder what sewing machines would say if they could talk? Actually I don't wonder what they would say, I wonder more about the lady (or gentleman) who sewed with the sewing machine. Was she an accomplished seamstress, did she make quilts, what kind of quilts did she make, did she pass her machine down or did it just sit there waiting for someone to love it or cast it away? 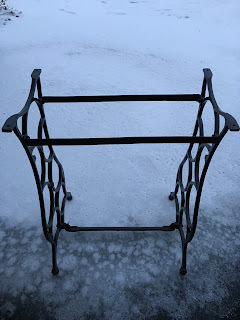 I recently bought this treadle frame from a friend. I bought it sight unseen, kinda. My sister sent me a picture of the frame and I bought it from the photo. I only gave $25 for it. I thought it was a pretty good price. I'm going to add a wooden top and use it for a bedside table. When I picked it up at mom's over Christmas, the lady sent a ziplock back of goodies and told my mom that I would probably want these. She was right. Look what was in there. A box of rusty attachments, the owners manual for the sewing machine, some vintage rulers, some vintage emery boards, lots of wooden spools of thread. And what are these little gems? 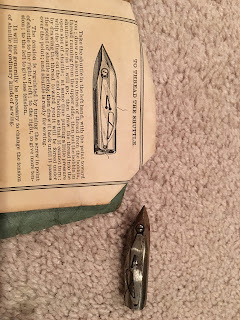 I thought they were bobbins for the sewing machine that was, sadly thrown away. I was amused at how they saved this thread from something, wound it on a piece of cardstock and no doubt had intentions of using it one day. The owner's certificate of authenticity folded neatly in the middle of the owners manual. 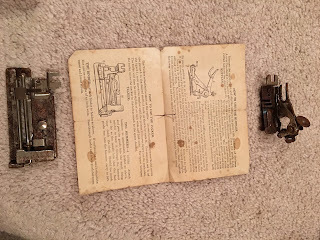 And the owner's manual that's seen it's better days! 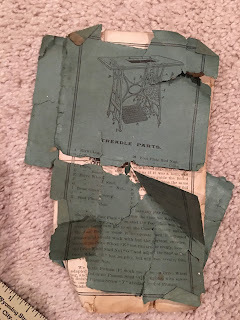 It's still intact and readable but extremely fragile. I'm not sure what, if anything, that I'm going to do with it. Suggestions???? 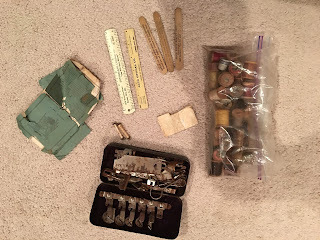 And did you ever wonder what all the gadgets were in those attachment boxes. Well, wonder no more. Everything is explained in the manual. 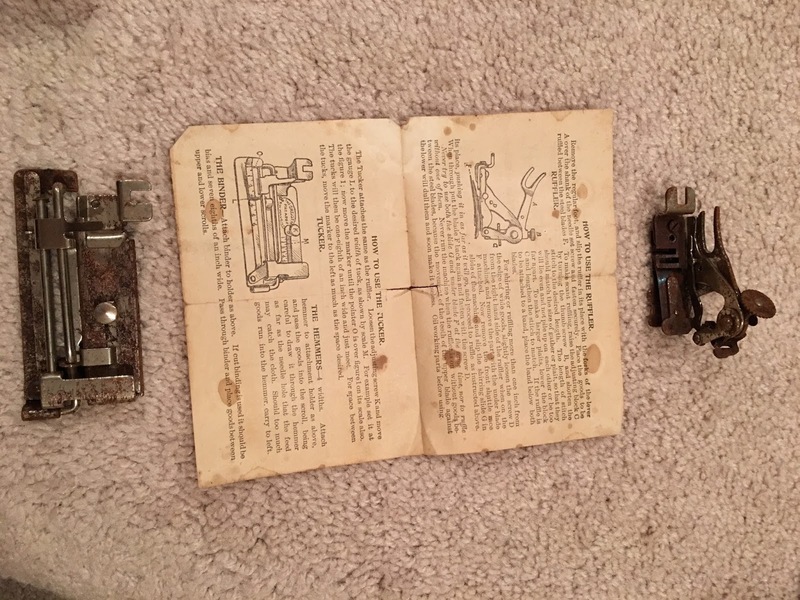 The one of the left is a "Tucker" and the one on the right is a "Ruffler"
All those gizmo's in the lid are various sizes of "Hemmers". Too bad I don't have the treadle machine to go with all these attachments. It was fun exploring all the things in the bag anyway. How fun to get the irons and other parts. I'm the same as you when it comes to vintage/antique machines to wonder about those that owned and used previously. 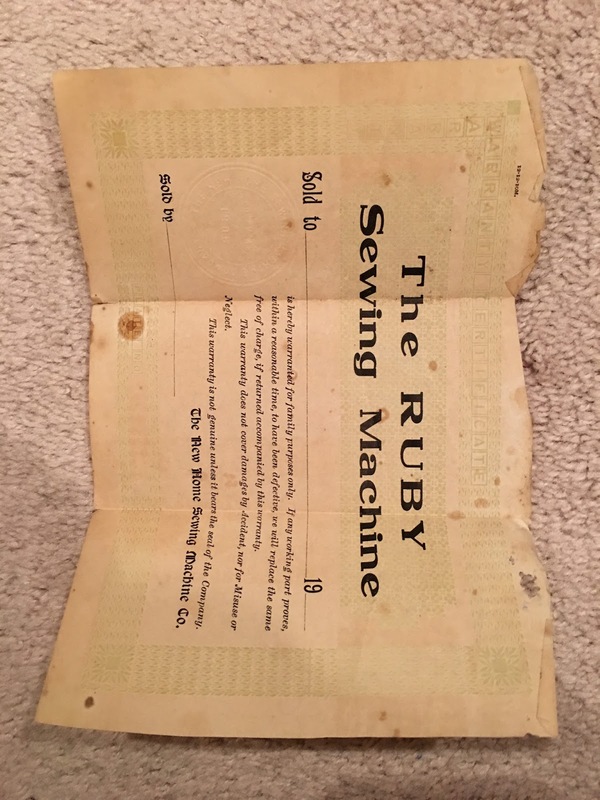 Is "the ruby sewing machine" the name of it or by reading the manual is it something else. 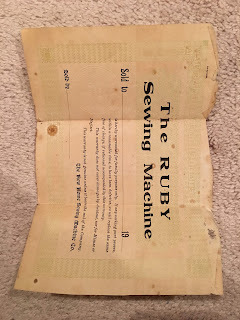 The ruby sewing machine peaked my interest. No I don't collect old machines but I do have a couple and never heard of the ruby. I just like looking and seeing them. Thanks for sharing your find. You know that might make an interesting quilt rack too. OH how fun. What a find. Heck, that extra stuff was worth the money just for the history. 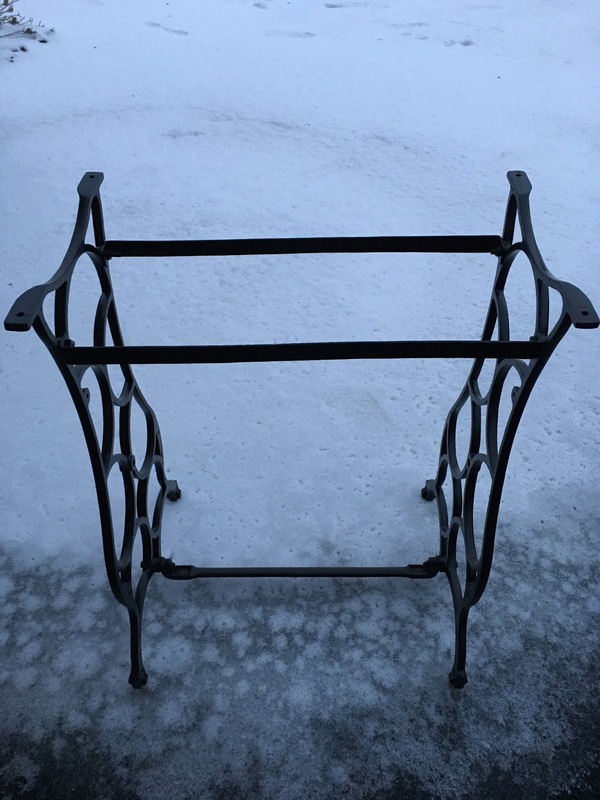 I have a treadle frame similar to that although it looks a little different. My Mom bought it years ago when I was in high school, so yea, we are talking YEAAAAAAAAAARS ago haha, anyway, she had a piece of marble cut to fit inside the legs so she could use it as a table. I sadly have nowhere in my home to put it so it's buried in our back storage room. That marble is extremely heavy and just sat on top of the frame. It never budged the entire time it sat in the living room in front of the sofa while I was growing up. Actually, those skinny metal spool looking things are the bobbins. 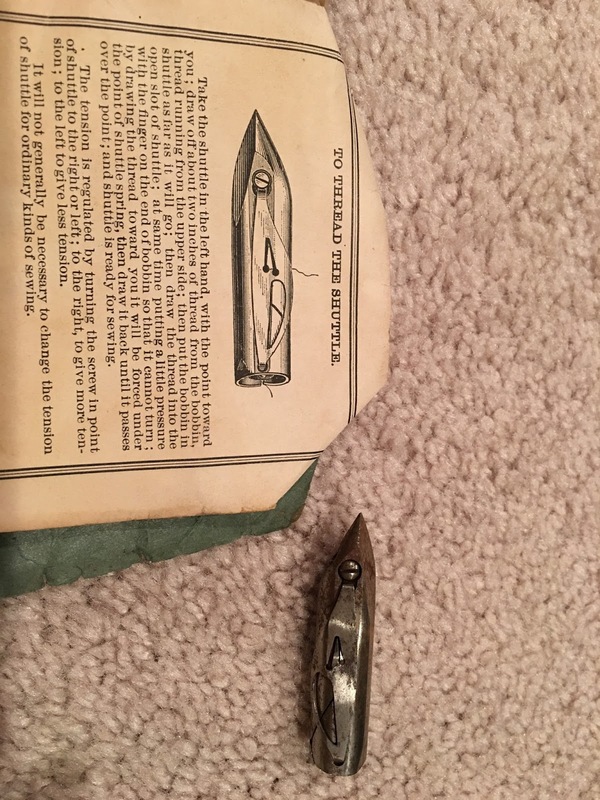 The second photo is of the bobbin case. 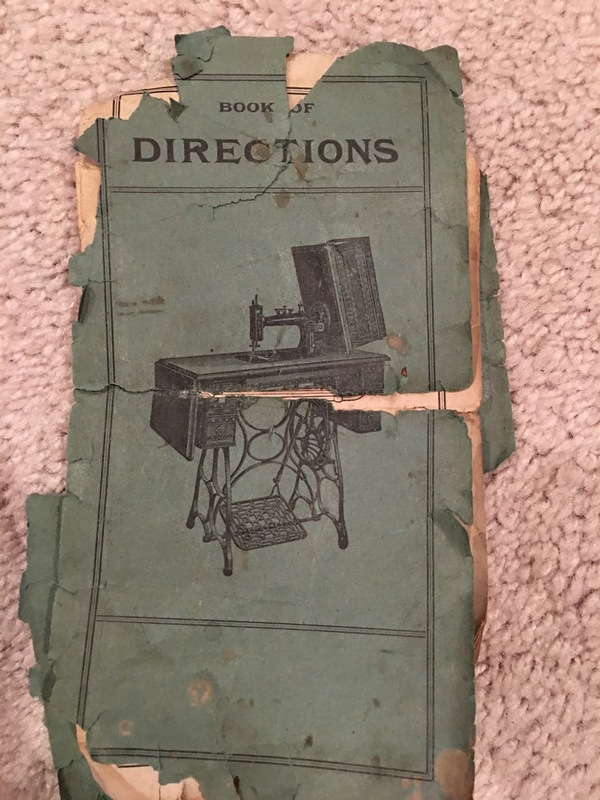 My mom's antique Singer treadle uses ones that look very similar. You insert the bobbins into the bobbin case, do a bit of "magic" with the thread to thread it through and then insert the case into the machine.